Gt Dunham towermill was built to replace an earlier smockmill. 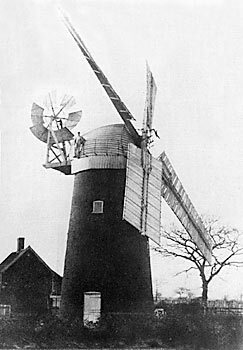 The 5 storey mill mill had 4 double shuttered, patent sails each with 8 bays of 3 shutters and 1 bay of 2 shutters that drove 2 pairs of 4ft French burr stones. The boat shaped cap held a tall narrow, iron gallery and a 6 bladed fan. The tower had two opposite doors on the ground floor. In the latter half of the 1800s a 8hp horizontal steam engine with a Cornish boiler and shaft was working in a building alongside the windmill and powered another two pairs of French burr stones. A substantial & well arranged Dwelling House with barn, stable, outbuildings & excellent Windmill working two pair of stones with all the going gears & appurtenances belonging & three enclosures thereto containing by survey 6 acres, most desirably situate in the parish of Great Dunham, a good corn district within easy distance of the capital markets of Dereham, Swaffham & Fakenham, late in the occupation of Mrs. Copland, who will render possession at Michaelmas next. Apply to Mr. Pitcher, Solr. Lynn or to the Auctioneer, Mileham near Litcham. A TOWER WINDMILL, Dwelling house, Barn, Stable, Piggeries, Granary & Cart shed, all Brick built & tiled, erected in the centre of Six Acres of Freehold land situate at Great Dunham, Norfolk. Apply to Mr. Arthur Copland on the premises or to Mr. Wm. Baldry, Tombland, Norwich. A Capital BRICK TOWER WINDMILL with four floors & driving two pairs of 4 feet stones. Also Barn, Stables & 6 acres Arable & Pasture Land adjoining. The above property is all Freehold & is desirably situated at Great Dunham within a short distance of the Railway Station at Fransham & is now in the occupation of Mr. Arthur Copland who will give possession at Michaelmas next. Apply to Mr. Ling, Solr. Or Messrs. Butcher, Auctioneers, Norwich. Windmill commanding an excellent situation. Steam Mill, Residence, Bake Office, stable, Yards & Outbuildings, together with Six Acres of Arable & Pasture LAND in Great Dunham, Norfolk. Clowes & Nash have been favoured with instructions to Sell the above by Auction on Friday 22 November 1889 at the Kings Arms Hotel, East Dereham at 2 for 3 o’c. Particulars at the Auctioneers’ Offices, Bank Chambers, Norwich or of the Vendors’ Solicitor, Mr. H. E. B. Rackham, 1 Queen Street, Norwich. Action, Brown v Girling, the plaintiff is a millwright living in Norwich & the defendant a miller at Great Dunham; the amount sued for being £12.6.5. for work & labor as per account stated. Mr. Chittock appeared for the defendant who paid £2 into Court; the general answer to the claim being that it was an overcharge & that it was unreasonable that the defendant should be required to pay the railway fare of the plaintiff & his workpeople in travelling from Norwich. Judgement for plaintiff/with costs except for £1.3.6. 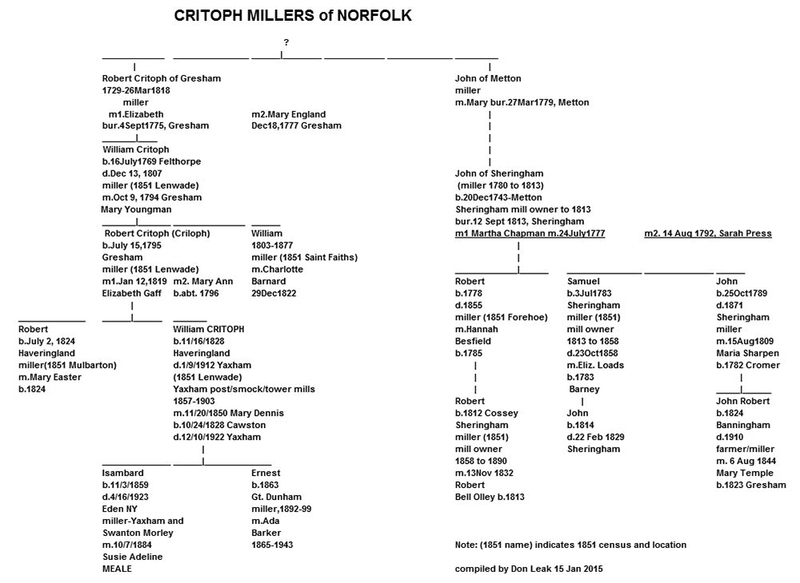 GIG ACCIDENT AT SCARNING - On Friday evening, about seven o'clock, Mr Girling, miller of Great Dunham, and Mrs Girling, were returning home from Dereham in a gig, driving a valuable horse. On arriving near the New Inn on the Swaffham Road, a collision took place with another horse and gig said to be driven by Mr Cordy of Scarning. The result was that Mr Girling's horse, said to be worth from fifty to sixty guineas, was killed on the spot. Fortunatley, although very much frightened, neither Mr or Mrs Girling received any material injury. How, or by whose fault, the accident happened is not clear, the night being so very dark. Situate in the above parish, on the east side of the road leading from Dunham to Beeston & now occupied by Mr. E. Critoph. Sale to commence at 4 o’c precisely. 1 Queen St., Norwich, Vendor’s Solicitor & from the Auctioneer, East Dereham & Fakenham. Has received instructions from Mr. E. Critoph (who has disposed of his business) to Sell by Auction an assortment of HOUSEHOLD FURNITURE …. & the Miller’s & Baker’s Outdoor Effects comprising 4 HORSES …. Two capital miller’s carts on springs (nearly new) good baker’s cart …. Chaff cutter, grindstone, pulley blocks, beams, scales & weights, sack barrows, pig trough …. Also about 3 Tons of HAY. Auctioneer’s offices - East Dereham & Fakenham. Have been favoured with instructions to Sell the above by Auction on Friday 22 November 1889 at the Kings Arms Hotel, East Dereham at 2 for 3 o’c. As Miller, roller, wind or steam, eight years experience, good references. E. Grice, Dunham Mills, Swaffham. By 1970, all that was left was the derelict, roofless single storey 8ft high, 19ft diameter windmill base that was being used as an aviary. 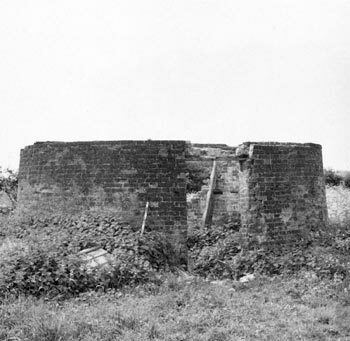 The house and other outbuildings remained nearby but the bake office was in ruins.